Are you looking to have some fun painting? Or, maybe you’ve always wanted to learn how to paint? Either way, you are going have a great time at our painting classes in Richmond. Knowing your shapes, letters and colors are the only tools you need to get started. Bring a friend and your sense of humor and we will take care of the rest – including ALL of your painting supplies (smocks, brushes, easels, canvases and everything in between!). We have partnered with The Wine Loft to bring you an extensive menu of wine and other beverages as well as a Menu of flatbreads, sliders, cheese boards and more. Both food and drinks will be served to you while you are painting! Also, should you so choose, you can bring in your own wine and pay a $10 corkage fee for regular sized bottles (up to 750 ml) or a $20 corkage fee for larger bottles (greater than 750 ml) to The Wine Loft. Looking for something fun for a group? Call us to book a fun and exciting painting party in Richmond. We can accommodate most groups, small and large. Birthdays, reunions, and church or office gatherings are just a few of the reasons to enjoy having fun and participating in a painting party. Best of all, these parties are fun for everyone, young and old, and absolutely no experience is needed for our painting classes. 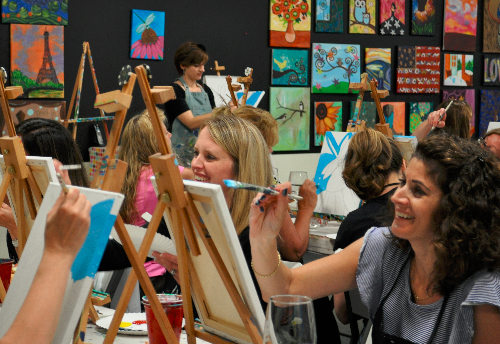 You’ll have great time in Richmond at your very own private painting party! Our studio offers kids camps for all ages! Click on our calendar to register. We can’t wait to paint with your artists! Why Limit Fun Fridays to Kids? Our summer Fun Fridays for kids were such a hit – we thought adults might like them too! Join us for adult Fun Fridays! Bring your friends and your lunch and join us at 10:00 a.m. for a quick escape (and of course, fun! ).